Facebook ads provide highly targeted opportunities to reach your audience. On Facebook, your ads show up on the right side of the News Feed, making them highly visible. Facebook ads are similar to traditional pay-per-click (PPC) ads — you can place a bid for how much you are willing to pay per click, or you can pay per thousand people who will potentially see your ad. But as with Google, your cost depends on how popular your keywords are. Your ads can link to pages on your website or your Facebook page to ramp up the likes. Facebook targets ads based on keywords within a user’s profile and her activity history on Facebook — what she has Liked and engaged with. Go to the Facebook Ad tool. Choose what you want to advertise — this could be anything from your own Facebook page to a blog post or a new product. 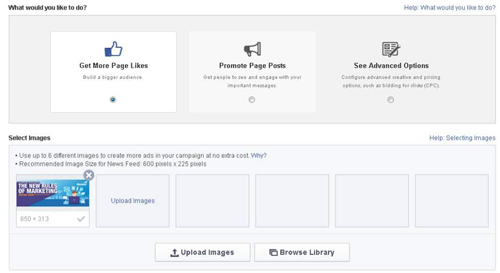 Next, choose what you want to do with your ad: Get More Page Likes or Promote Page Posts. Let’s choose the Get More Page Likes radio button. Select an image for your ad by clicking Upload Image. The following figure shows Steps 3 and 4. Create your ad headline, text, and landing view. The landing view is where people land on your page when they click your ad. You want them to land on the Timeline. This step also shows a preview of your ad on the right side, as shown in the figure below. Choose interests and a location. For this Marketo ad, the categories Marketo, software, application software, social medium automation, and desktop computer are chosen. The audience is narrowed down to include business and technology people. Take a look at the following figure as an example. For this ad, as shown in the figure below, Marketo wants to pay $20 per day and run the campaign continuously, starting today. You can also include an end date if you want the campaign to end at a particular point in time.